The case of the 43 students missing in Mexico has given life to a national movement. Weekend after weekend we have seen demonstrations in Mexico in various cities in Mexico, protesting the climate of impunity, corruption, and the economic conditions. Now joining us to elaborate on all of this from Paris, France, is John M. Ackerman. He’s professor at the National Autonomous University of Mexico and editor-in-chief of the Mexican Law Review. Thank you again for joining us, John. JOHN M. ACKERMAN, LAW PROFESSOR, UNAM: Thank you. 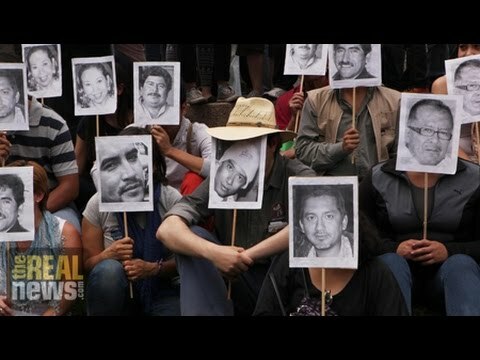 PERIES: John, impunity is rampant in Mexico. This is one of the issues that the protesters want to address. Can you elaborate on what is unraveling there? ACKERMAN: This is very, very important. If you look at the numbers, official numbers show that 6.8 percent of all crimes are even investigated in Mexico. This is a really shocking number. Out of those, some of them are punished, but not even all of those are punished. So these are official numbers from the statistics agency who did a poll of Mexicans and discovered that in 2013, 33 million crimes were committed, but only 2 million of them were even begun to be investigated by authorities. What happens is that the Mexican people don’t trust their authorities. They think it’s a waste of time. And in general they don’t trust or believe in democratic transition in Mexico. They don’t think that Mexico is a democracy. Mexico is the country which has undergone the least amount of political change in the entire continent. The political class is the same people who have governed Mexico for the last 85 years. And so what Mexico really needs is to regain the confidence of the people. But it’s very hard to imagine that this confidence could be regained through very minimal bureaucratic fixes or rehashing old economic plans, which look to actually, in the base, transform Mexican history and culture and basically turned Mexico into a dark shadow of the United States. This is the real problem, and this is what’s rising up. It’s not just about the students. It’s about Mexican history, it’s about Mexican culture, and it’s about Mexicans coming forth and saying that they don’t agree with this forced neoliberal integration into North America, and that they are still defending their Latin American legacy and Mexican history and history of revolution, and they want a second revolution today, which would mean another massive transformation of the political, economic, and social forces in Mexico, as we’ve had throughout the Americas over the last couple of decades. Mexico’s been left out of the game, but now it’s coming back. PERIES: Mexican President Enrique Peña Nieto has revealed his plan, his ten-point economic plan in the southwestern state of Guerrero, where 43 students had gone missing. Can you talk about what the ten-point plan is? And is that really going to address some of the economic conditions on the ground? ACKERMAN: I very much doubt that it will address any discontent, because basically Peña Nieto is using this political crisis as an excuse to expand his neoliberal attack on the Mexican economy. The Mexican economy is desperately in need of a sovereign, strong investment strategy, which develops the Mexican economy, doesn’t isolate it from the rest of the world, but of course puts the wealth and the welfare of Mexicans first. This is is what has not happened over the last 30 years of neoliberalism in Mexico. And almost all of the countries in Latin America, there’s been a response to this [incompr.] discontent has forced government institutions and politics to create new models of economic growth. This has not happened in Mexico. Mexico is the poster child for the Washington consensus to this day, and this strategy has failed. Peña Nieto said explicitly what he wants to do in the south of Mexico, what Mexico already has in the north. What does Mexico have in the north? Maquiladoras, export-oriented, terrible labor conditions in the agricultural sector. There was just an important report a couple of days ago in the L.A. Times, an ongoing series, actually, in L.A. Times about labor conditions and agribusiness in Mexico. The maquiladoras, the manufacturing are well known as being deathtraps. This is, you know, Ciudad Juárez. And many of the northern cities of Mexico are world-renowned for the violence and the femicides which happened there so systematically. And so that’s not exactly a model model for the south. The south, what it has in Mexico is a long history of indigenous traditions, community leadership, political organizing in Guerrero, Chiapas, and Oaxaca. And this could be and should be tapped into for economic sovereign growth. But instead of doing that, Peña Nieto’s designing a strategy to bring foreign corporations, oil giants [incompr.] the oil reform into the south. And this will be an excuse to increase repression against the Mexican people. And that is what is really dangerous about what’s happening today in Mexico is that the political class in Mexico is, because, I would say, most importantly, because of the undying support of the United States government administration, the Mexican government feels completely free to repress citizen uprisings. And this is terrible. They’re doing the same thing to Mexico as they do to the African-Americans in the United States. The link between Ayotzinapa and Ferguson, I think, is very close. It’s the same drugs, the same guns, which are poisoning the cities of the United States and the mountains of Guerrero and the Mexican people. The same youth are being shot down by police in both contexts, and political expressions are being repressed. And these are political outcries for democracy, for participation, and for inclusion, which the system is not allowing to break through the surface. And so I think there’s a lot of potential, looking on the good side of it, for binational organizing between the United States and Mexico and for alliances between the Latino and African-American communities on both sides of the border. PERIES: John, in an earlier interview you did with us, you talked about the organizations that have formed in response to the missing students. But these organizations are now broadening their demands to include economic demands. Can you describe the class nature of the organizations and the movements? ACKERMAN: No, this is very important, and this is actually what marks the difference between this mobilization and the previous ones in Mexico. It has had a whole series of protests in 2011 around the drug war, or in 2012 against the return of the PRI, the old authoritarian party, to power, especially Peña Nieto; in 2012 around the energy reform and the education reform. But this one has a very specific–and those were mostly, especially the first two, urban middle-class movements. This is very much of a grassroots, popular class movement run with the leadership very clearly in the hands of peasants from Guerrero, who have a very clear indigenous heritage and a very long history of community and popular organizing. And Guerrero has been a very important state historically throughout Mexico for political organizing. In the Mexican independence itself, José María Morelos was from Guerrero. During the revolution it was a very important place. And during the 1970s, of course, this was the site for guerrilla warfare, a guerrilla uprising with the leaders of Lucio Cabañas and Genaro Vázquez. So Guerrero has always been very much of a center for social consciousness and popular mobilization. And once again, it’s coming forth. And that’s one of the reasons why this movement has had such staying power, because these guys are really in it until the end, and they’re very serious about changing the system and getting to the bottom of issues. They have much more solidity in their leadership and their stubborn insistence on achieving justice than the more middle class based movements of the last few years. PERIES: John, I thank you so much for coming on The Real News and enlightening us about what is going on. We’ll certainly be following this story, and I hope you join us for that. ACKERMAN: Of course, Sharmini. It’s a pleasure and an honor as always.